The Achilles tendon is the largest and strongest tendon in the human body. It is a very important tendon in normal gait (walking). Over time the tendon can wear out, in particular with frequent running/jumping activities, weight gain or increasing age. Degeneration of the Achilles tendon can occur close to the middle of the tendon or at its insertion into the heel bone. Non-operative management is often very effective at reducing or eliminating symptoms and this comprises of Achilles stretching exercises and a heel lift orthotic. Surgical management is reserved for patients who have tried the non-operative management without success. Surgery can comprise of tendon debridement, tendon transfer and debridement of bony prominences, which irritate the tendon close to its insertion. 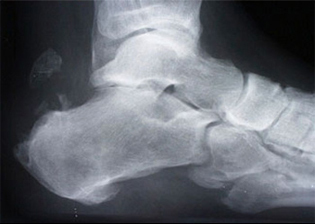 This photo illustrates the typical location of a (Haglund's) bony prominence related to insertional Achilles tendinosis. This bump can rub in shoes and can occasionally be painful. 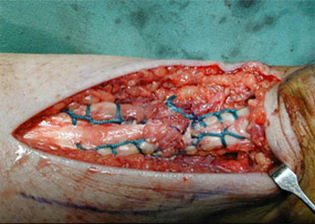 Repair and reconstruction of the worn Achilles tendon. 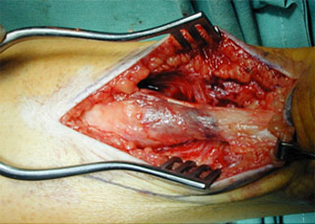 Incorporation of another (strong) tendon into the repair is sometimes required to augment a severely diseased Achilles.